Q. How do I search for & borrow movies, films, videos, dvds or other Audio-Visual material? 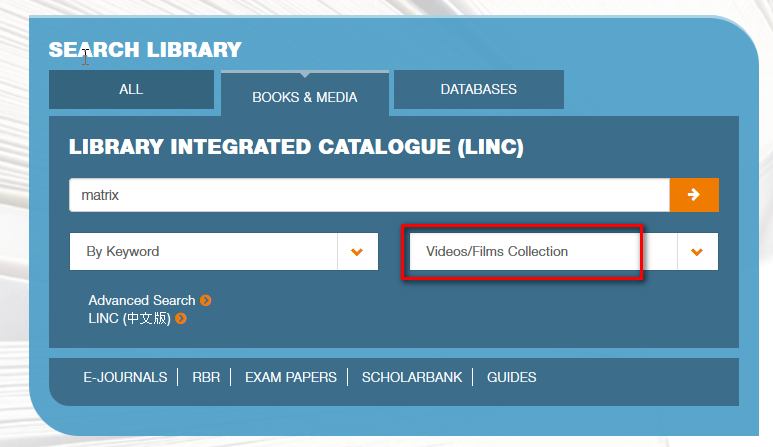 If you are searching for a specific movie title, you can use FindMore@NUSL or LINC. 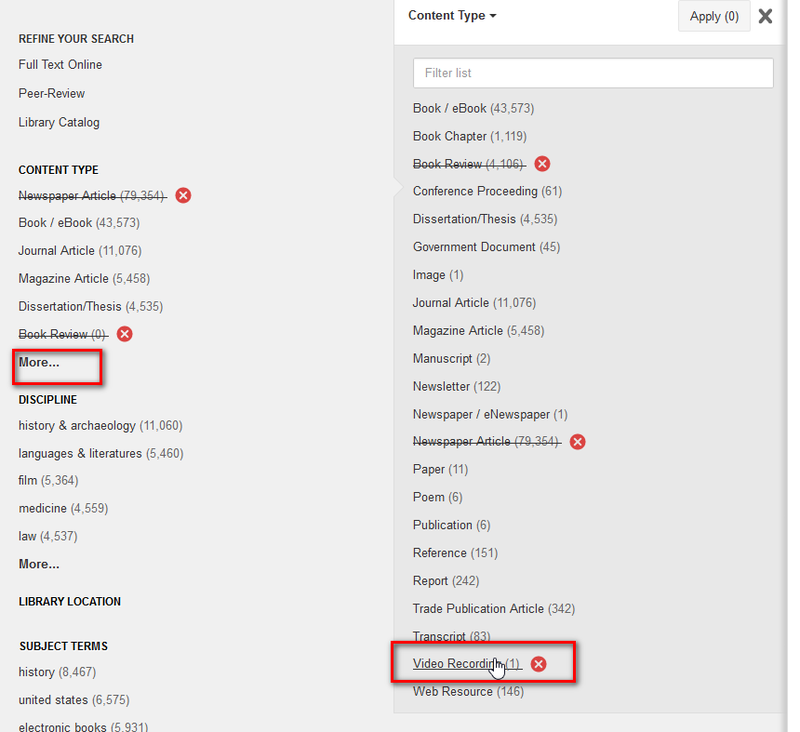 In FindMore, you can do a search and then restrict the search to Content Type, Video Recording (Click on More... if necessary). . Note that this will give you physical copies such as DVDs as well as online streaming videos from online video libraries. You will usually need to know the stack number of the item, so click in through the title to take note of the stack number. You can also use LINC. a) Audiovisual items are for viewing in library premises only. 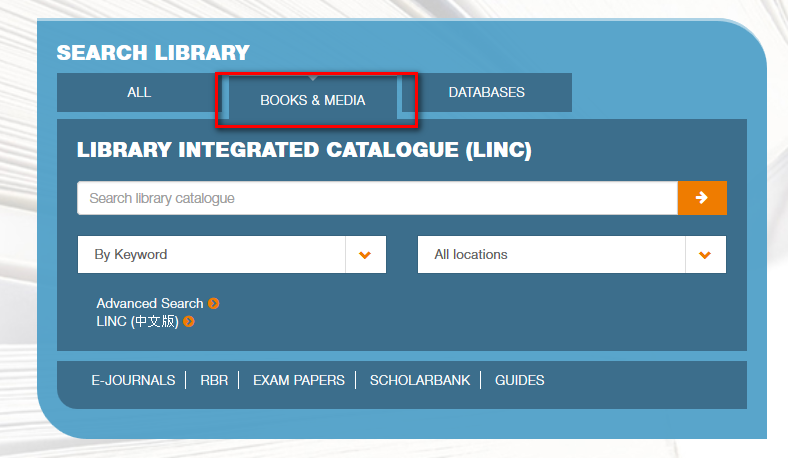 Lecturers who need to borrow this out of library can use the Advance Booking Form for Media Materials online form (under heading Services for Teaching) from the services list. b) Movies (feature films) cannot be digitized and uploaded to IVLE due to copyright restrictions. The film can only be screened in the course of teaching and audience is limited to course participants. e) The media collection in Yale-NUS College Library can only be used by Yale-NUS staff and students as well as NUS staff. NUS students will not be able to use the medial collection in Yale-NUS College Library. Most AV material have to be requested online or in person and collected at the loans desk and require that you take note of the stack number. For Central Library, you can use the multi-media collection located at the loans desk. Note: Audio-Visual materials in the library can only be viewed and borrowed for the purpose of teaching and for course use in NUS. How do I do an advanced booking for Media Materials? How do I request to digitize Audio or Video materials? Can movies be digitized for uploading to IVLE?